This is a sticky post that will show all my upcoming events, panels, signings, etc. I'll edit the list as it changes. So here it is! 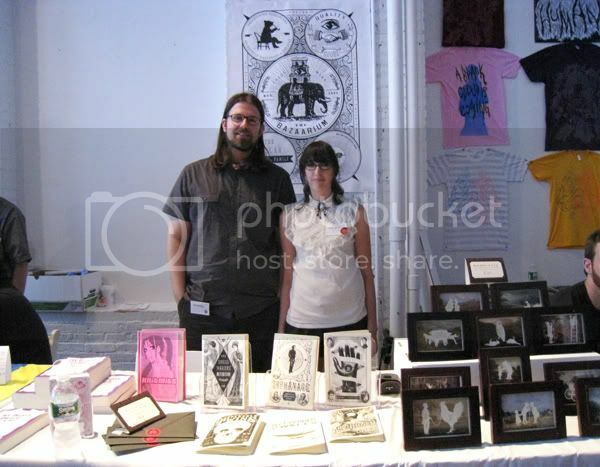 MoCCA Art Fest, June 6-7, 2009: Will and I will be there as the Bazaarium, and will be selling our Victorian inspired wares! You can find us at table 629. San Diego Comic Con, July 23-26: Will and I will be there as the Bazaarium, and will be selling our Victorian inspired wares in the Small Press area. More info to come. I realize it's been a million years since I've posted on LJ, and I guess that means I'm resurrecting my blog from the dead in order to post this, but I wanted to announce that Will and I will have a table at the MoCCA Art Fest this weekend and we'll be selling our Victorian wares from our online shop The Bazaarium. We'll be at table 629! I can't tell you how crazy and hectic things have been. The Bazaarium has been doing great and has been keeping us both very busy with orders. We're still figuring out how to best run a small business - it's definitely been a learning process, but I feel like we're getting the hang of it! We definitely want to grow the business even more in the future and are looking at ways in which we can do this. We'll also have a table at Comic-Con this year, which will be a first for us! We also just moved into a new, bigger place with a garage that we plan to convert into a studio. I've moved a lot in my life but not so much locally. I thought a local move would be easier than a cross-country move... and in some ways it is, but you still have to pack everything up and then unpack everything. It's still a ton of work. And right now we don't yet have internet hooked up at the new house, and all our stuff is scattered around so it makes preparing for MoCCA really difficult. We'll make it work, though. We always do! Anyway, I just wanted to let you all know I'm still around even if I haven't been posting much lately. Once things settle down I plan to update more often and let you all know what projects I'm working on! Just a couple hours ago I finished my last page on Sabrina. I won't lie - I got a little misty-eyed. Not just because I was sad - but because I also felt really proud. I've been working on Sabrina for almost 5 years and have 42 issues under my belt. In comics these days, it's rare to have that much longevity - especially for a first-timer like myself. But the most satisfying thing was knowing that I was able to tell a complete story - the way I intended it to be, from start to finish. It wasn't like Archie told me in the middle of an arc that it was canceled and I had to rush to tie up loose ends. In some ways I always knew the final issue would be #100, and I wrote my stories so they would lead up to that climatic issue. Of course, had Sabrina continued beyond that, I had plenty of ideas of where I would go next, but my main, epic "Four Blades" storyline was always meant to be resolved by issue 100. It's also amazing to see how much my art has changed and grown over the years. I look back on some of my first issues and I find them absolutely cringe-worthy! But doing comics has really helped me develop my skills and I feel like I finally have my own "style". Anyway, I couldn't have done it all without the support of my awesome inker, Jim Amash, letterer Teresa Davidson, and colorist, Jason Jensen. And of course, my original editor Victor Gorelick who hired me originally. I used to be so intimidated by him only to realize he's the nicest guy. And my current awesome editor Mike Pellerito whom I also consider a friend. I'm going to continue doing some things for Archie, so this isn't "goodbye", but just a thanks for everything so far. I hope my fans will continue to support me and read whatever I come out with next! Time for my yearly year-end review and meme! I realize I haven't been blogging much of late.... to be honest it's partially because there's not much to blog about and I don't really like to blab about boring day-to-day stuff (that's what twitter and tumblr are for. But I don't really keep up with those, either). But partially because I feel like this year has been sort of a year for reflecting, keeping quiet, and observing. 2007 was really rough and while 2008 was an improvement, things are still settling down, like the ripple effect of a stone being thrown in the water. The economy has taken a toll on everyone, and it seems to be affecting everything from everyone's general mood and optimism, to physical assests like savings, to book sales, and getting freelance work. It's affected me a bit in all these ways, most notably that my run on Sabrina is coming to an end. It's sad because it's been my job for the past 5 years, and I've really grown to love the characters and world. But all good things must come to an end and I really feel fortunate that it will end with me having told a complete story, rather than it just trailing off and fading away. I'm looking it as an opportunity to focus on new projects, including my own personal projects which I haven't been giving as much attention to in recent years. I am pleased that I kept up with most of my resolutions for 2008. 1. Write More. I want to possibly attempt a novel. I want to write way more Dollar Dreadfuls. I wrote more Dollar Dreadfuls and started a novel. I wish I had done even more, but I feel pretty satisfied overall. 2. Get Dollar Dreadfuls off the ground, open our online store, and create more content. Will and I finally launched our online shop, The Bazaarium and so far, it's been doing great! The next step will be to expand on our store and figure out how to streamline things, such as figuring out how to make prepping each individual order take less time. 3. I resolved to be more healthy. I'm going to take vitamins and exercise more. I think this will improve my mood and productivity. I think I also want to learn to cook so we don't eat so much fast food and tv dinners. I've started taking vitamins everyday and taking better care of my teeth (still have yet to go to the dentist.... I'm scared!!!). I rode my bike a lot and got in good shape over the summer, but I haven't really kept up with that in the fall and winter... As for cooking... well, that's something I still need to work on! 4. Go on vacation with Will. Will and I haven't really gotten much of a break this year, and the last time we went on a trip together was over a year ago. I really want to go somewhere where we can just unwind and see something new. This was the one thing that didn't really happen. Will was supposed to come with me to Japan, but that fell through because of work, so I ended up going by myself rather than lose my deposit. We were also supposed to go to Palm Springs for a weekend, but that also fell through. Will works so hard and I can't help but think of those Bahamavention commercials. I want to hijack him and force him on a relaxing vacation with no computer! This is my ultimate resolution for 2009, especially since it'll be our 10th anniversary of being together! So basically, my resolutions are the same, just bigger and better. i have a good feeling about 2009. Nine is my lucky number and I feel hopeful about a future where Obama is president. Now, without further ado, my yearly meme under the cut! Happy New Year, everyone!! This is where I'll be on my birthday! Will and I will be there selling our Silhouette Masterpiece Theatres and Dollar Dreadfuls. We're sharing a table with friends who will also have some cool things for sale! If you're in the area I hope you can stop by! 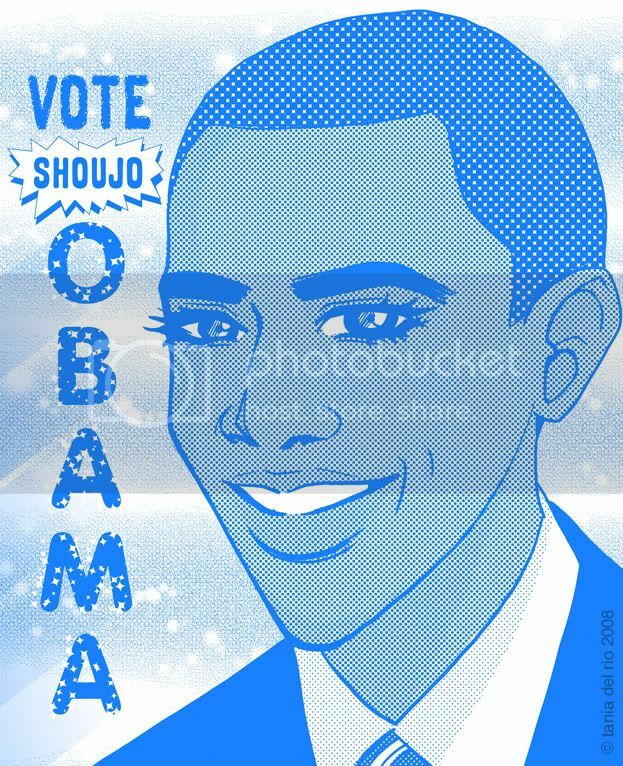 On Tuesday, Vote for the Magical Shoujobama! Last night, at about 4am I woke up and wasn't able to get back to sleep. And for some reason I kept thinking about DC's Minx line and why it's failed and how much I dread the assumptions that people will make that comics for girls are destined to fail or, worse yet, that girls don't read comics - which I know is untrue, and many other people know is untrue. But the failure of such a promising line does cast a shadow on those arguments. When I first heard about Minx, I was really excited to read the books and see what would come of the line. I ended up reading quite a few of the books and I guess I can agree with what's been said all around: a couple were really good, but most of them were just "ok". A couple didn't grab me at all. In some cases, the art was fantastic, but the stories weren't as strong. Or the stories were entertaining, but the art looked a little rough. But overall, I'm saddened to see such a noble effort fizzle so quickly and my heart does go out to the writers and artists involved. I could comment on the books' presentation and cover design and placement in book stores, but I don't claim to be knowledgeable enough about marketing to make any assumptions on how these might have contributed to the poor sales. I know manga has also been in decline in recent months, but girls are still reading it, and I still see them crowding the aisles of my local Borders. And, as I lay in bed with insomnia, I began forming another theory about why American comics geared directly at girls typically do not do as well consistently as manga has. I feel that a lot of American comics for girls feel a need to "teach a lesson", or inject some sort of important learning experience or nuggets of advice for the young, female reader. And this is all well and good in theory, but at the same time, and I can speak for myself when I say that girls don't like to be talked down to, or preached to. Sometimes one just wants to read a comic for pure enjoyment and nothing else. This is why I mostly read "boy" comics growing up, because all the "girl" comics seemed to assume that I was simple-minded and that I needed to know the difference between right and wrong. Now, obviously, comics for girls have come a long way since then and there are so many more titles that girls - and boys -can enjoy that aren't condescending. But I feel that, even though it's not as obvious nowadays, comics for girls still feel a need to impart a lesson or message. This brings me to think about manga. Doesn't it teach lessons too? Well sure. You'll see the common themes of the importance of friendship and reaching goals etc. But I think that the manga format manages to dilute the message and make it more digestible. Over a series of several 100-page volumes, a girl can learn her lesson, but because it's so spread out it doesn't feel as preachy. By contrast, American comics typically are shorter in length - whether it's a self-contained graphic novel (as in the Minx line), or a 32 page comic which offers even less space to tell a story. But the result is that the writer feels the need to cram their message in before the end of those 32-100 pages, and it comes off a little stronger than it would in a longer, serialized work. I can freely admit that I do the same thing with Sabrina. I always feel a need to make some kind of point with each issue. Maybe it's just a cultural thing, and Americans are more prone to wanting to inject some morality or lesson into our work because of our country's Christian roots, or the backlash against "immoral" comics that followed the Seduction of the Innocent. That may be a stretch, but hey - it's something to ponder! But I can say that reading titles like Nana or Hot Gimmick - the characters are not perfect. They often make mistakes. And I feel like the Japanese attitude is "You know what? That's ok?". Because the Japanese do not have the same "rules" that many Americans have about what is appropriate for girls, I feel that manga writers do not really "judge" their own characters. They simply allow them to experience things. Maybe they'll change because of it, maybe not. Either way, it's ok. I remember when I first read Hot Gimmick, the lead character Hatsumi drove me nuts because she was such a pushover! I kept reading and reading, fully expecting that somewhere along the way she would learn to stand up for herself and grow into a better person, because this is what I would expect from an American comic. But by the last page of the last book I realized that Hatsumi hadn't really changed at all. And at first I was really disappointed. But then I realized "well, maybe that's ok." Some people don't change. Some people don't necessarily learn from their experiences. Some people are content to let other people take charge. And it may not be what I prefer, but who am I to judge? It's the same thing with the super-popular Twilight series. I read the books and I'll be in the minority when I say that I did not care for them- particularly the main character, Bella. I kept waiting and waiting for her to grow a spine and to stop being so co-dependent, but it never happened. And for me, this lack of growth in her character was a bitter disappointment. But again, just like in Hot Gimmick, I was forced to realize that, despite making choices that I felt were "wrong", Bella made the choice of what she wanted in life. And maybe that choice was little more than a Vampire boyfriend and baby, but it was still her choice. Some girls want to become career women, some want to grow up to become mothers. But again, who am I to judge? At the end of the day, I feel that Twilight doesn't really try to teach anything. It's just an entertaining love story and maybe that's why girls like it so much. Bella may be chaste and naive, but the characters of Gossip Girl are the exact opposite -- yet the series is equally appealing to girls. Why? Because the characters are flawed, they drink and sleep around and sabotage each other, and the show (and books) make no apologies for that. It may be "Every Parent's Worst Nightmare", but it's pretty damn entertaining! And as horrible as it does sound, if one actually reads or watches the series, they do learn that the characters, flawed though they may be, also have the capacity to change, they have the capacity to forgive and care for each other, and to learn from their experiences. But it's not preachy because that's not the point. It's entertainment, pure and simple. And I feel that many popular manga series for girls, such as Nana, are similar. They feature characters that are both lovable and flawed, who make mistakes, who sometimes act needy or selfish, who sometimes do the right thing, but sometimes don't. And it's not trying to force a lesson down readers' throats, it's just telling a story about life and relationships. As a last example which also contrasts sharply with the previous ones - take Archie comics in general. They have a huge female readership and yes, they are skewed a little younger than the girls who are watching Gossip Girl or reading Nana. Archie has always been known to be "wholesome" -- so doesn't that contradict my claim that girls don't want to be lectured in their comics? Well, not exactly. Archie, as a company, has established that their characters will never smoke or drink or do drugs or ride in a car without a seatbelt, etc etc. But the stories each month are not about those things. You won't find a story called "Betty Buckles her Seat Belt!". The "rules" exist in the background, but once they are established, it frees the writers to just focus on telling short, funny stories intended to entertain. The point of a typical Archie story is to tell a joke and they're not nearly as preachy as you might expect them to be. There are, admittedly, the occasional stories where a deliberate point is made but Veronica will always be a spoiled rich girl. She may have individual stories where she realizes that her attitude can gets her into trouble, but next issue she'll go right back to being the same, spoiled rich girl. The characters are constant... they don't change. And some may say the characters never "grow" or "learn", but that's not really the point. It's all about fun and that's why so many kids grow up reading Archie comics. Anyway! Sorry for the rambling post (It was 4am when I was thinking all of this), but in summation I just think girls want to be entertained. Pure and simple. Because we'll get our life lessons by experiencing life. But comics, sometimes, just need to be comics. I haven't posted much in a while because I've been pretty busy with work and such, but I wanted to let you all know that I have two interviews up! I basically talk about my plans for Sabrina as the story nears issue #100, and also a bit about my TOKYOPOP project! The first is on the fabulous blog, Comics Worth Reading, by Johanna Draper Carlson and you can read it HERE. The second is on Newsarama. Check it out HERE. Many thanks to Johanna and Benjamin Ong Pang Kean for taking the time to interview me! So you always wanted to be a rock star, huh? NOTE: Hit "refresh" to generate new random quotes, because clicking the quotes link above will just give you the same quotes over and over again. I'm impressed with how well it worked out! Will and I got back from New York last night. We had a great time at MoCCA. It was so nice to be back in NY and to hang out with old friends even though it was sort of a whirlwind trip and we didn't have as much free time as we would have liked to see everything (and everyone) we wanted to. But I think we've both realized that one year is just too long to be away from NY, so we're definitely going to try and go back more often for fun. The show was a success for us, even with the sweltering heat outside that possibly deterred some people from going to the show. We sold tons of Dollar Dreadfuls - selling out of a couple of our titles, (as well as my Knit Wits ashcan which I didn't really expect!) I didn't get a chance to look around the show as much as I would have liked - the days literally flew by for me, but I did do a couple quick passes of the floor and bought a couple things which entertained me on the long plane ride home. Overall, it was a wonderful show (as always) and we've already signed up to be back next year! In other news, this weekend I'll be participating in the Tour de Cure, which is a 34 mile bike ride for the American Diabetes Association. 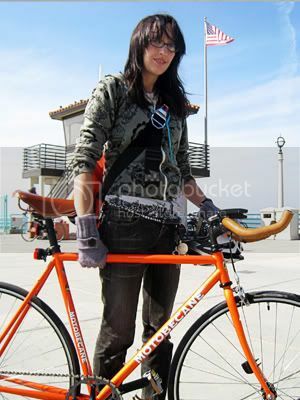 I've never ridden that far before, (and I'll be riding a fixed gear bike!) so it will be a challenge. But I have been training very hard these past couple months, so I feel confident I can do it! I've already raised 700 dollars - and I'd like to take this opportunity to thank everyone who has donated so far. Your support means so much to me. A couple of my family members, including my brother, suffer from diabetes so it is a cause that is near and dear to me. I want to raise as much as I possibly can in the hopes of one day finding a cure for this disease! So, please, if you can spare even just $5, I would truly appreciate it! You can sponsor me online at my PERSONAL SITE. Thank you! !